CDR Services- We produces all type of CDR and competency statement writing Services for Engineers Australia assessment. Unlock opportunity with complete CDR packages for EA right away for positive results. Contact Today For free Assistance with us! 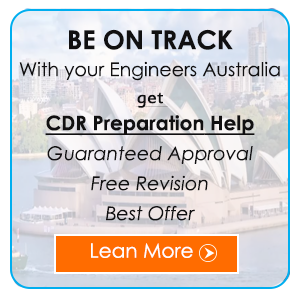 CDR ENGINEERS AUSTRALIA – providing various CDR Writing services, i.e. Preparation of CDR Career Episode Writing, CV & Summary Statement, KA02 / RPL Report and reviewing the report if got rejected by EA, you can get a complete solution with your assessment and feedback analyzing of CDR report. You will get expert advice to achieving the 100% approval form Engineers Australia. Our CDR writing expert teams assure you to be a part of Australian & NZ Country. We are improving our services day to day by adding more CDR reference & information as per EA reports and for other engineering disciplines.